Growing edible flowers and plants in the garden adds variety and usefulness. Daylilies offer over 12 thousand varieties sold in nurseries and all can be eaten. Blooms can be eaten at all stages of growth. Flower petals can be added to salads, boiled and even stir-fried. The daylilies foliage can also be eaten. However, daylilies act like laxatives and the person should be careful not to eat too many. Dormant daylilies will die to the ground when cold weather begins to sit in. Growth will return once the weather warms again. Applying mulch will help protect roots from freezing temperatures. The catherine woodbury daylily grows 30 inches tall. Blooms have gently ruffled petals and will be pale pink. The throat of the bloom will be yellow. It blooms in mid to late summer. 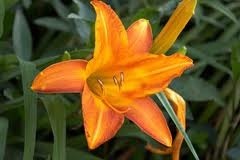 The happy returns daylily grows 15 to 18 inches high and blooms yellow flowers. This daylily will rebloom from late spring until the first frost. Hyperion daylilies grow 40 inches tall. This rebloomer will have yellow flowers and, according to the Clemson Cooperative Extension, it is one of the most well known of yellow daylilies. Semi-evergreen daylilies will act like both dormant and evergreen daylilies. In colder climates they may die to the ground or simply stop growing in winter. In warmer climates they will behave like evergreens. Fairy-tale pink daylilies will grow to around 24 inches tall and have soft pink ruffled petals. The throat of the flower will be green. This rebloomer begins blooming in mid to late spring. The wedding band daylily grows 26 inches high and is named for the gold edge that circles the top of its white blooms. Blooms appear in spring and continue through the growing season. Strawberry candy daylilies grow 26 inches tall and will bloom in early summer or late spring. The 5 ½ inch flower is pink and the ruffled edges are red. Evergreen daylilies will keep their foliage all year long. In warmer areas the leaves will stay green constantly also. Joan senior daylilies grow to around 25 inches tall. The Clemson Cooperation Extension states that Joan senior is one of the most well known of white daylilies. Blooms will be almost white and have a yellow eye spot on its petals. This reloomer begins blooming early in the season. The Joylene Nichole daylily will grow 14 inches tall and blooms in late spring. This rebloomer has rose coloring with darker rose colored veins. The throat of the bloom will be golden yllow.